• Proper manifesting of material to be done by us with verification of EPA # prior to arrival. • We use low flow, high pressure powerwashers to clean the insides of the tanks and add a minimal amount of water to the waste, thus keeping costs down. • We provide the proper non-sparking equipment to safely cut inspection windows into tanks. 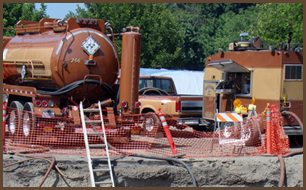 • We can provide the certified industrial hygienist to certify tanks in the Los Angeles area. • We can provide the cranes to pull the tanks out of the ground as well as the trucks to haul away the tanks for destruction. • We have degassers to properly control the vapors of gasoline tanks per AQMD rule 1149. We are permitted in the South Coast AQMD, Ventura APCD, Santa Barbara APCD and San Luis Obispo APCD. • We can transfer clean fuels from one tank to another using a double diaphragm pump. • We provide all necessary documentation for disposal of the waste from the licensed disposal facility, destruction of the tanks from a licensed destruction facility and/or certification of the tanks from the certified industrial hygienist for closure reports.